This is strong copy, but…no, Insider doesn’t really deal with these questions. But that doesn’t matter because Insider is a great game. 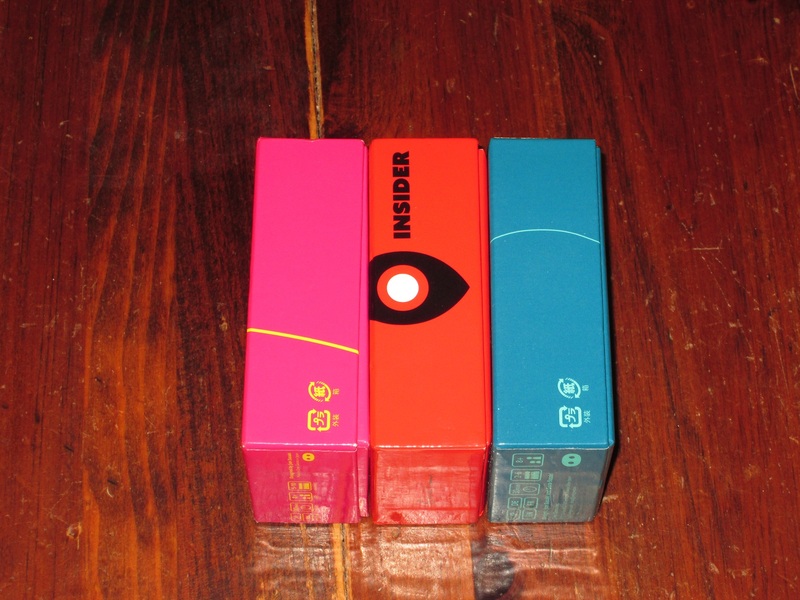 Insider is a guessing/social deduction game for four to eight players. Players ask the Master yes or no questions to discover the hidden word. The Insider knows the word and tries to direct conversation toward success. The Insider wins if the word is guessed but he or she goes undetected; the other players win if they can discover the hidden word and find the Insider. Insider set up for six players. Not much to set up here. To begin, shuffle the clue cards and the role tiles. Give each player one role tile. The player with the Master tile reveals it. Everyone else–the one Insider and the rest of the players, the Commons–keeps their role hidden. At the start of the game, the Master directs everyone to close their eyes while he or she cuts the clue deck and reveals a card face-up next to the deck. 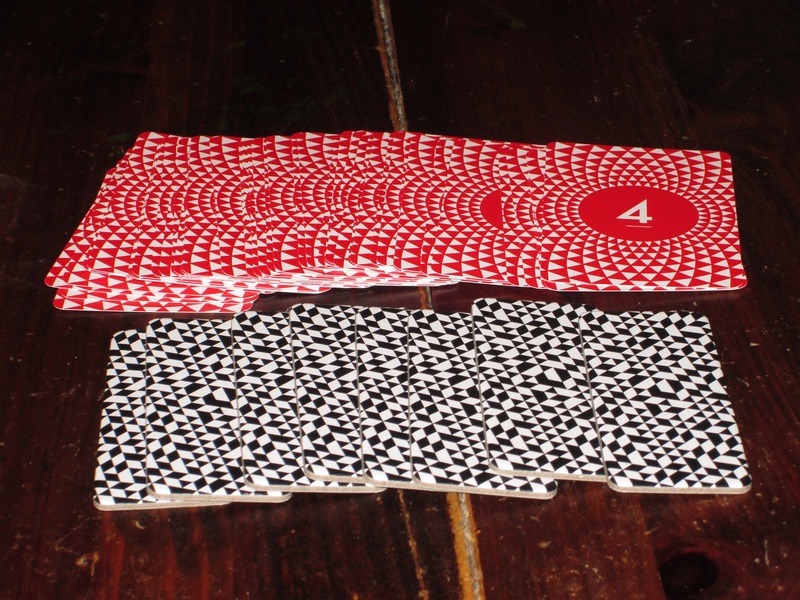 Each card has six possible clues on it, and the top card of the deck points to which is the clue for this round. Once finished, the Master closes his or her eyes and directs the Insider to look at the clue card. The player who received the Insider role card looks at the clue before closing eyes again. The Master then opens eyes, puts the clue card back on the deck, and tells everyone else to open their eyes. The sand timer is flipped. Players have five minutes to discover the clue. They may ask questions, but the Master may answer only “yes,” “no,” or “I don’t know.” If the clue is not guessed by when the timer runs out, everyone loses. 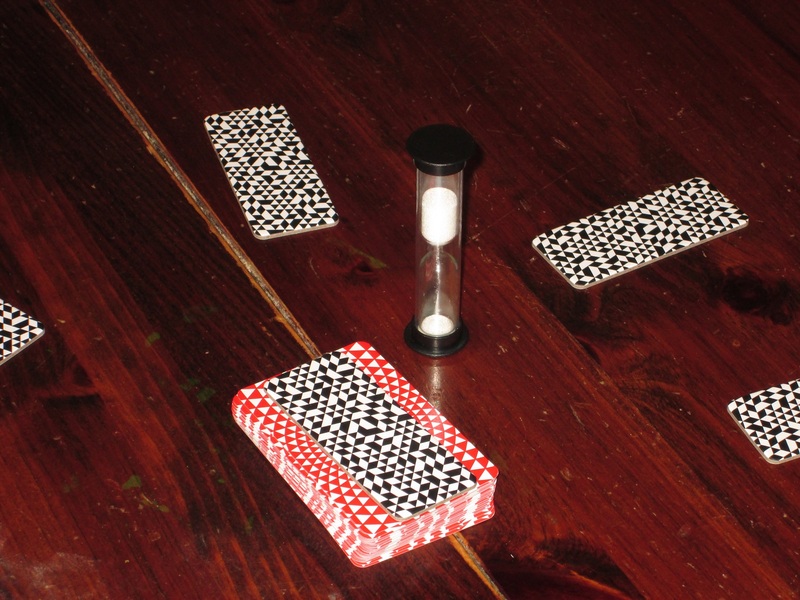 If players guess the clue, the Master flips the timer again, and players have until the sand runs out to discuss who the Insider is. Once the time runs out, players vote whether the person who guessed the clue was the Insider. (This player only reveals his or her role tile if there is a clear majority.) If there is no clear majority, players point to whoever they think is the Insider, and the person with the most votes has to reveal their role tile. If the revealed tile is the Insider, the Master and Commons win. If it is not, the Insider wins. When I describe Insider as “20 Questions with a traitor,” I usually get puzzled looks. How can a traitor possibly be injected into a game as benign as that? But don’t doubt the strength of this premise. After all, we’ve already seen simple drawing games turned into social experiments. And we’ve seen simple guessing games turned into junior high attempts at fitting in. Insider certainly bears some resemblance to social deduction games like One Night Ultimate Werewolf, Spyfall, and A Fake Artist Goes to New York. And yet for as often as I describe the social deduction game space as crowded, I’m still amazed when a new game elbows its way in to become part of the canon, which is what Insider has done. YOU ARE BEING CONTROLLED. Either that or you are just having a great time. Insider takes a game that everyone already knows how to play–20 Questions–and injects a strong element of uncertainty. What makes Insider work is the relative obscurity of the clues on the cards. Playing a game of 20 Questions, I might come up with something for the players to guess, but the players have some prior knowledge limiting the scope of what the guesses might be. As off-the-wall as I try to be in choosing a clue, the players still know that it’s I who choose, and hard as I try to think of something unguessable, it’s still a clue that I had to have been able to access on the fly. This is where the genius of the cards in Insider comes in. The word might be something like “broad bean.” I know what this is, but never in a million years would I have chosen that as the word for others to guess. Similarly, things like electricity, or global warming, or signal come up, and while these are perfectly valid words, they’re not within the scope of what I would have chosen. And the Insider has to work in this subtle gap between what the Master might choose and what the clue actually is. 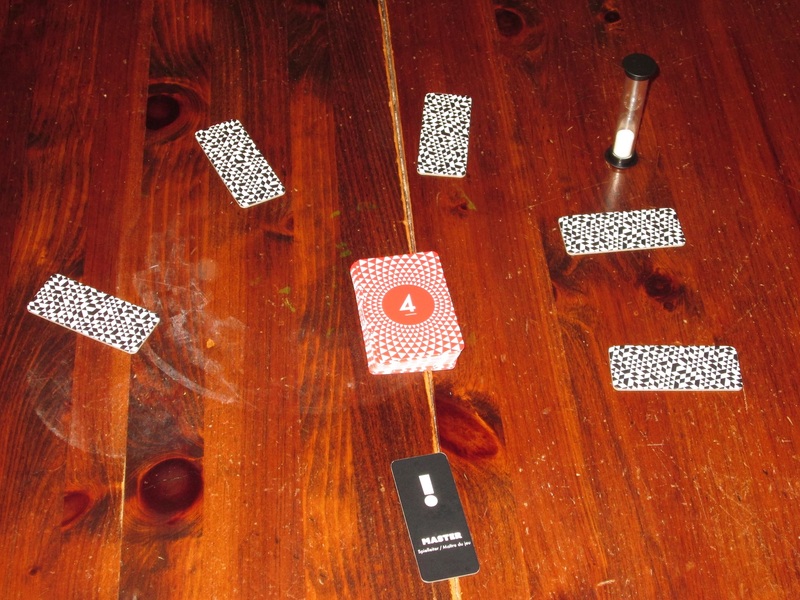 Each clue card has six possible clues, and the number on top of the deck signals to the Insider which word is the clue for this round. The Commons players might have a certain cognitive scope in which they’re asking their questions. The Insider’s job is to widen that scope to include the clue on the card. Sometimes this is easier said than done. Occasionally the Insider can rely on the Commons players to do the Insider’s job on their own. In one game, the clue was “board game,” and the Insider just let us figure it out on our own with only minimal interjections. In other cases, where the clue is “global warming,” the Insider has to subtly shift the conversation to be about concepts and away from physical objects. And while it might be easy to ask a question like “Is it related to carbon emissions?” that’s a dead giveaway, and the Insider’s goal is to go undetected. The timer is running down… Will you find the clue–or the Insider–in time? There’s another fascinating limitation to the game: the conversation to suss out the Insider is limited to the amount of time the group used to find the answer. If the Insider is able to lead the group to the clue quickly (or even to guess it quickly him- or herself), the conversation will be short. This might lead the group to point fingers at the guesser, so it can be risky for the Insider to guess, but sometimes limiting conversation can be helpful. If the game takes the full five minutes, conversation usually ends before the timer runs out. The Master here has an interesting role to play, because while the Commons are trying to figure out the clue, they are also (hopefully) paying attention to who the Insider might be. Because the Master is free from the guesswork of figuring out the clue, the Master usually has some perspective about who was asking good questions–maybe questions that were too good. I like that the “GM” for the game is also able to play, which was one of the biggest innovations (in my opinion) that came with One Night Ultimate Werewolf: everyone gets to play for the full time. 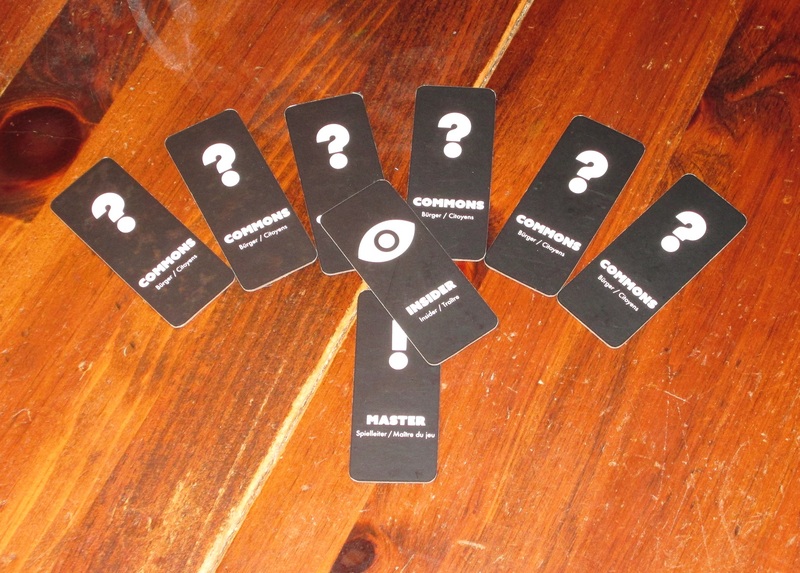 The role cards in Insider. It’s also interesting that the Master is allowed to answer only “yes,” “no,” or “I don’t know.” Some Masters are a little more loose with the role, answering questions that could go either way in a manner that better channels players toward the answer. The most fun comes from sticklers, I think. (Of course I’d say that–I’m a stickler.) I was once the Master, and the clue was “vase.” The players were asking me what it was made of. “Is it made of glass?” The answer is really “sometimes,” but that isn’t one of the answers I could give, so I said, “Yes.” They asked if it was made of metal. Again, “Yes.” It’s fun to see players examine the taxonomy in their heads and try to figure out what the clue is. This makes the game fun no matter which role you are: if you’re a Commons, you have the fun of trying to discover the clue. If you’re the Master, you have the fun of answering questions and being chief examiner of the Insider (you have the other benefit that no one suspects you). And if you’re the Insider, you have the delicious puzzle of trying to lead the other players without making it look like you’re trying to lead the other players. There have been several games in the “one player is the oddball” genre lately. Spyfall is (now perhaps was?) probably my favorite in this genre, but whenever I mention Spyfall, I also have to bring up the caveat that it’s stressful, and a lot of people–at least, if my groups are any indication–don’t want the stress of having to blend in when they don’t know anything. A Fake Artist takes the Spyfall concept and uses a task that most people are bad at (drawing) as a release valve for this tension. Insider relieves tension by flipping the spy role on its head: instead of the spy knowing nothing, the spy knows everything. The task, then, isn’t to fit in while not knowing anything; the task is to fit in but not let on that you know more than the others. The backs of the cards and role tiles are “loud” enough that they mask wear even without sleeves. I also like the way they look. And this simple change is enough to make the game still fun to play without being overly taxing on the player singled out for the Insider role. In fact, there are several ways you can play as the Insider. You can heavy handedly guide the discussion, showing everyone the path they should follow–and probably be outed. Similarly, you can remain silent and let the group rise or fall based on their own guesses–and possibly lose. Or you can take a middle ground, framing the conversation without making it look like you’re framing the conversation. And the game is in achieving this balance, because when it happens, Insider amazes, whether you are the one doing the shaping or not. 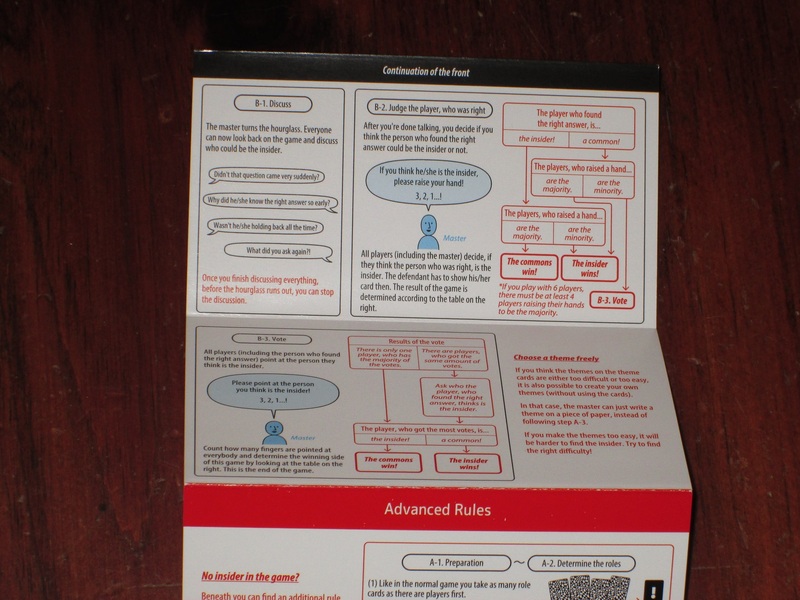 The rules for Insider are simple, just one sheet front and back with plenty of diagrams. In one game of Insider, I had never felt more manipulated in my life. We were down to the wire with only a few seconds left to guess, and all of a sudden, out of nowhere and on a completely different wavelength from previous guesses, I asked, “Is it a tent?” The rest of the table was stunned–it was completely out of left field, and I was immediately accused of being the Insider. “You just saw the timer going down and decided to chance it on a guess!” I was initially too surprised to say much, but as the conversation went on and I retraced my steps, I was able to piece together what questions framed the guess that finally made the whole picture come into focus. We found the Insider that game, but not without some doubt among the players. 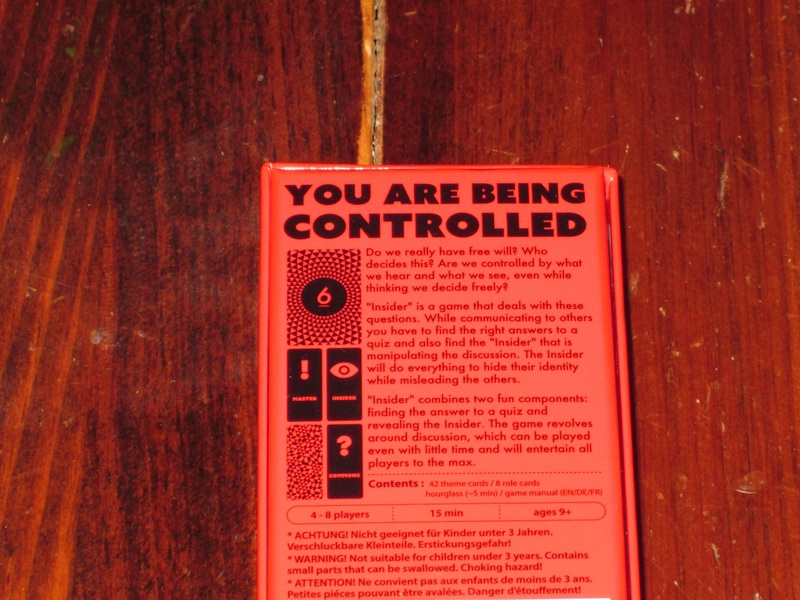 But while I joke about the copy on the back of the box, it was somewhat thrilling to consider the question “Am I being controlled?” The guess felt like my own, but at the same time I knew I hadn’t come up with the answer by myself. Of course, there are some games where the Insider isn’t sufficiently found, or isn’t found at all. And those moments are some of the best, when you can plant, Inception-like, the idea for a guess in someone else’s mind without them recognizing that you’re the one in their dream. In one game, I led the table to “Mount Everest”–and was even the one to guess it myself–without a single finger pointing to me at the end of the game. Oink Games look nice next to one another, don’t they? They are also TINY, small enough to be held in the hand. Insider ranks well on the “memorable games” meter. Because the game is an experience, recalling details is easier. You can remember when Matt tanked the team rather than be outed as an Insider, or when Adam was able to hide because the whole table was guessing the clue on their own, or when Bryan evaded suspicion because everyone was working against their natural bias to always suspect Bryan in the social deduction game. Because Insider creates these memories (and does so often), I think it’s one of the best in this genre. There are some things to be aware of. Some have complained that the game comes with only 42 cards, and it’s true: there is a limit to replayability when you’ve only got 42 cards (even though each card has six clues on it). And the rules suggest as an advanced variant that the Master can even write down a clue. I’ve not played this way, but others have reported to me that they’ve tried this with cobbled together copies on their own, and the results were not as great. (It really might be an advanced mode: in these forays, the players were all new.) The reason is that the words chosen for the cards are often obscure–they’re things that you will likely know what they are, but you might not encounter them every day. And that makes it fun for the players because the Master is often not completely familiar with the object, or at least familiar enough to know every facet of it. I once had to answer questions about “electricity,” which is hard to do with only “yes,” “no,” or “I don’t know” answers, given the questions thrown at me. 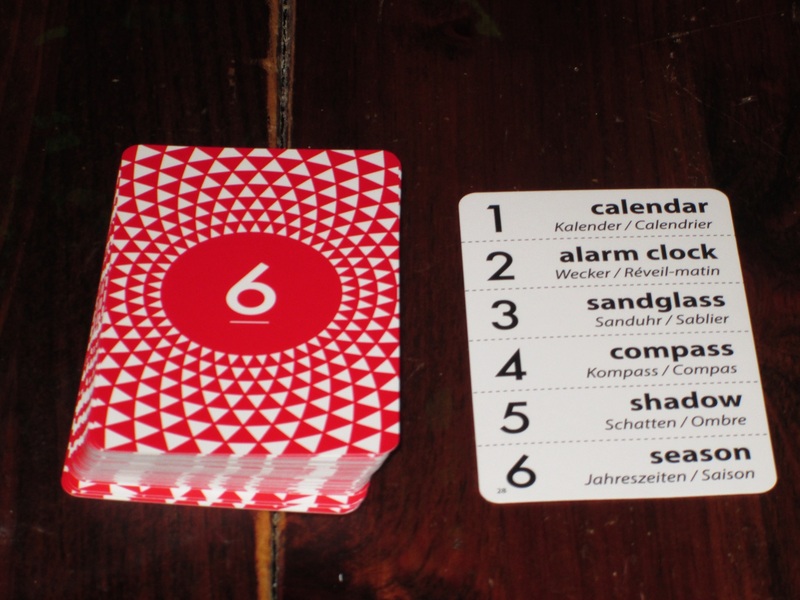 (“Can I find it at the hardware store?” Well, yes, but…) I also like using the included cards because each card has six words on it that are variations on the same theme. This means that even if you draw a card you’ve had before, you aren’t guaranteed to get to the same conclusion by asking the same questions. The deck is a simple way to offer good replayability. Is it infinite? Likely not, but after nearly 20 games, I’ve not encountered anything that hasn’t worked. 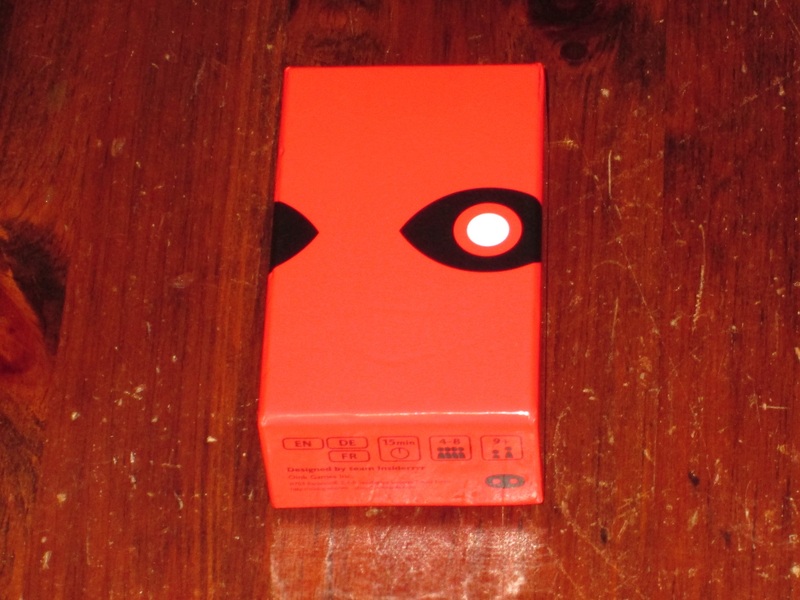 I know I’ve mentioned this before, but I LOVE the compact size of Oink Games boxes. I love it even more that this doesn’t feel like a microgame. It’s a full game in a tiny box. The components of Insider are very good. I love the bold look of the game’s cover, and the components inside are well designed. The role tiles are a weird shape, and the card barely fit in the box as-is, so sleeving isn’t really an option here, which is usually taboo in social deduction games. However, the backs here have a loud enough design that it’d be difficult to spot any distinguishing marks anyway, so they work. And boy, do I love that it comes in the standard Oink Games box. 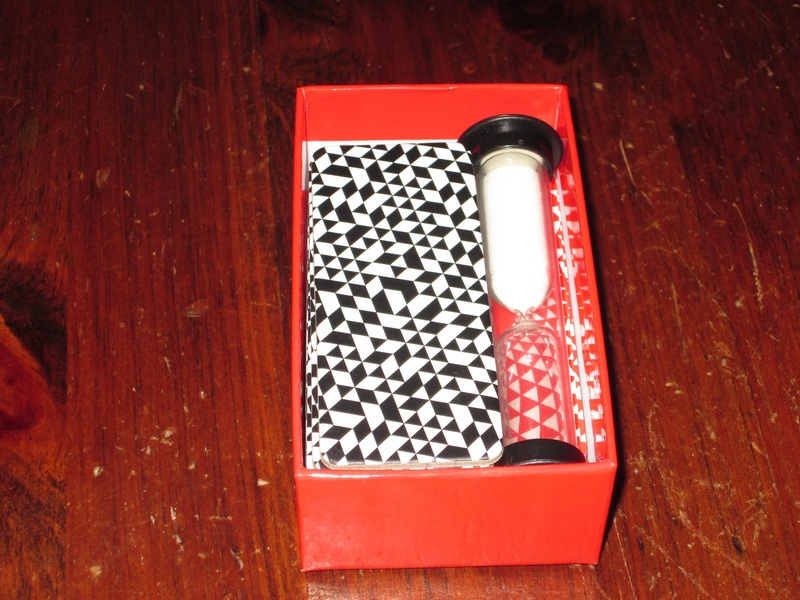 The tiny box is small enough to slip into a large pocket or a small purse. This is the kind of game you can carry with you literally anywhere, and it has the kind of addictive gameplay that will make you want to carry it anywhere. The game advertises play for four to eight players. I prefer it on the higher end of this spectrum, but six might actually be the sweetest spot. (Enough players for the Insider to blend in a little without feeling intense pressure but not so few that the Insider has to do all the work.) I played with five and it worked too, but I think the six to eight range is probably best. Once again, I thought the social deduction genre was stagnant, having given me all it has to offer. And once again, I am in awe when a fresh concept like Insider reaches my table. I can’t say that Insider will be the kind of game that will last forever without some kind of expansion, but for now, it is the social deduction (and even just social) game I most want to play. I simply can’t wait to control or be controlled by my friends again.